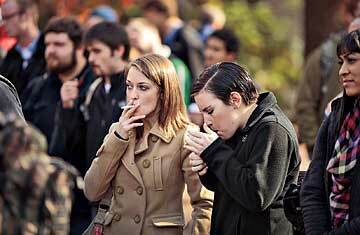 Students at a protest of the University of Kentucky's new campuswide tobacco ban. At many colleges, smokers are being run not just out of school buildings but off the premises. On Nov. 19, the University of Kentucky, the tobacco state's flagship public institution, launched a campuswide ban on cigarettes and all other forms of tobacco on school grounds and parking areas. Pro-nicotine students staged a "smoke-out" to protest the new policy, which even rules out smoking inside cars if they're on school property.